Four Steps to Prepare Your Garden for Spring Planting - Word Matters! Spring has sprung, and it’s time to prepare your garden for spring planting. If you have already begun the process, all the better, but if not, here are the basic steps to get your started. It’s time to choose your seeds. No matter whether you’re planting flowers or vegetables, before you can begin to plant, you need to purchase your seeds and/or bulbs, so you’ll have them ready to plant, once you prepare your garden beds. Once you have chosen the seeds you want to plant, be sure to clean your flower beds and garden borders, by removing leaves and other debris from them. There are some leaves, grass clippings, and other types of garden waist that can be stockpiled into a compost bin and used as mulch for your garden. Be sure that the leaves won’t wilt in the event of becoming overheated. Maple leaves can take six months to a year to turn into mulch, but they can still enrich your soil. You can even begin collecting garden waste and certain types of autumn leaves for compost in late fall. Check with the experts at your local garden supply store to find out what leaves and other garden debris are best for soil cultivation. Before adding your compost, whether homemade or purchased from garden supply retailors, you need to use a shovel to turn the soil, and clear it of rocks and dead roots. 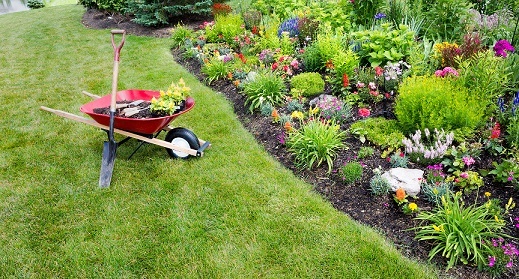 Do this task when the soil is dry, because you don’t want clumps of debris in your wet soil. Cover your garden with a layer of compost, about a half inch to one inch deep. The compost that you made from back yard debris will enrich your soil. After the soil has been loosened and you have covered your garden bed with compost, it’s time to apply fertilizer to your soil, in order to feed the seeds you plan to plant. While fertilizing your soil, you may want to consider adding a chemical to the soil to prevent any pests from invading your garden. My mother works part-time for a local farmer in South Central Georgia, and she told me that the farmer applies a pesticide chemical to the soil, long before he plants his strawberries. Talk to the experts at your garden supply store to find the best pesticide for your garden. Once you’ve followed these steps, it’s time to plant your spring vegetation and watch for the bountiful harvest.